These guys look like every dad that broke up an underage drinking party I was at ever. Indigo dyed-denim has an awesome handlebar though. I think these clothes aren't bad looking except for those FREAKIN COLLARS!I 50 years later I still don't understand why 70's fashions were so distorted.put a reasonable collar on that corduroy jacket,lose the bottom two pockets and maybe bring it closer to hip length and I'd totally wear the thing. Each one of these men looks like he has something to hide. And I agree with Hauntedheadful, the corduroy safari doesn't look too bad. Hey, isn't that Guy Karate? 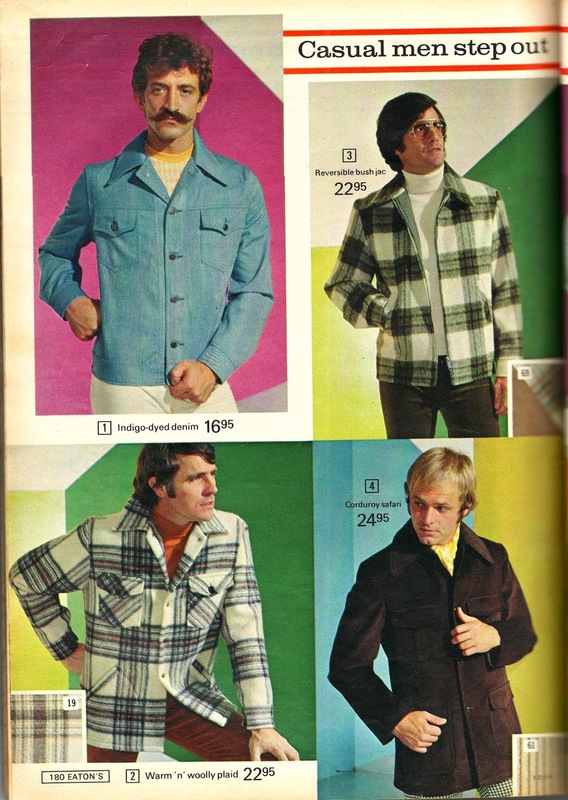 As far as 70's fashions go, this isn't too bad. The collars of  and  aren't going anywhere except that era of fashion, but that can be a good thing -especially if you're a hipster trying for that look. There's a chap at my local church who shows up every Sunday looking like Jonathan Harker/ Arthur Holmwood and/ John Steward from "Bram Stoker's Dracula" and, to his credit he wears it well. He's still a little too young to make Abraham Van Helsing or Quincey Morris work yet. The few times he tried, he crossed instantly over from, "look at that guy" to "Mommy, lookit da funny man". But he's obviously thinking long-term. So it's entirely possible a 70s-focused counterpart could make the entire ensemble in  work, especially the ascot. Many hipsters would probably insist on the amber "shooting glasses" from  as well. Curiously, the plaid jackets in  and  still enjoy popularity even today -with updated earth-tones and almost exclusively in ranching country out west.